Artists such as Camille Walala, Lakwena Maciver and more recently Yinka Ilori have been the driving force behind a surge of bright colours and font being used throughout the design industry. We are seeing buildings cladded with bold print and patterns, whole rooms covered in bright hues and furniture accented confidently with colour. This refreshing trend is breaking up what has become a sea of grey and concrete interiors following the industrial and Nordic design trends. This resurgence of colour was confirmed across the London Design Festival this year, where Ilori occupied an assortment of design platforms across London with his bright palette. 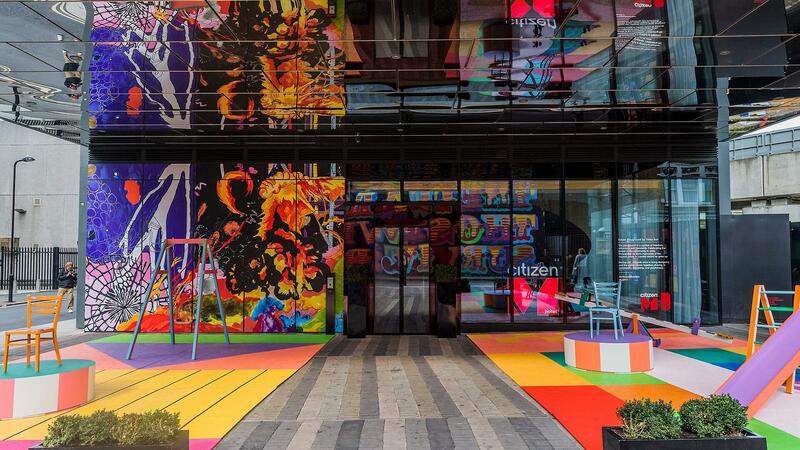 The largest being his vibrant pop-up, Estate Playground, in collaboration with citizenM Shoreditch. The entrance played host to an explosion of colour, with Ilori up-cycling and rejuvenating forgotten furniture. This playful interaction between form and colour was reflected in the mirrored ceiling of the hotel’s entrance, extending the immersive art form into the public space and drawing passersby to the hotel demise. Inspired by the bright patterns of traditional Nigerian textiles and Yinka’s memories of growing up on a North London council estate, the installation presented a sense of community, friendship and playfulness – all values embodied by citizenM. Through Instagram these artists have given themselves a branch to collaborate with brands, like citizenM, integrating their design into 3D environments as well as graphic applications. Will artists now represent brands the way spokesmodels have in the past, using their style as their trade mark? And why is it that people are responding so positively to themes of graphic content and joyfulness? You could argue that at a time of continued political and social dissent throughout 2017, we find comfort in the playful innocence of these colourful themes.